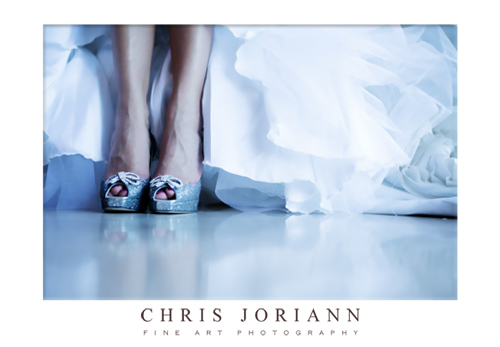 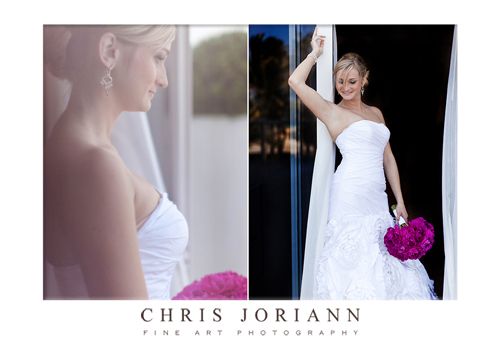 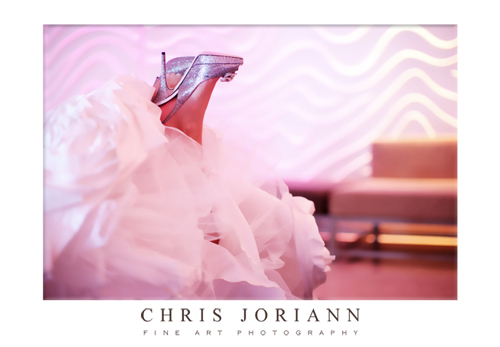 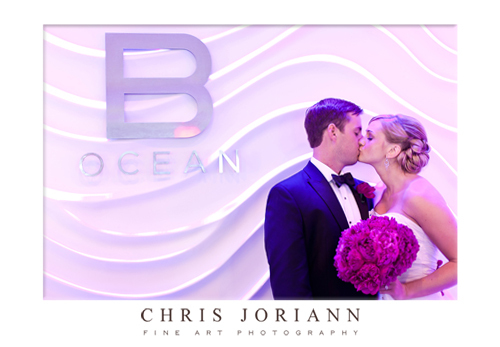 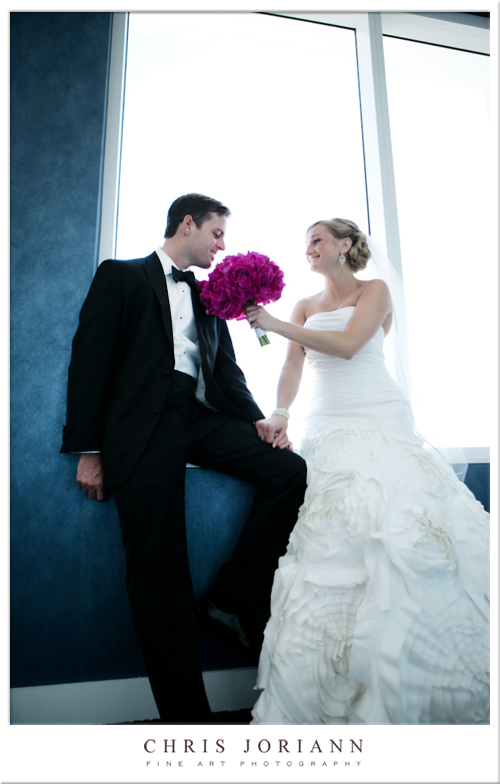 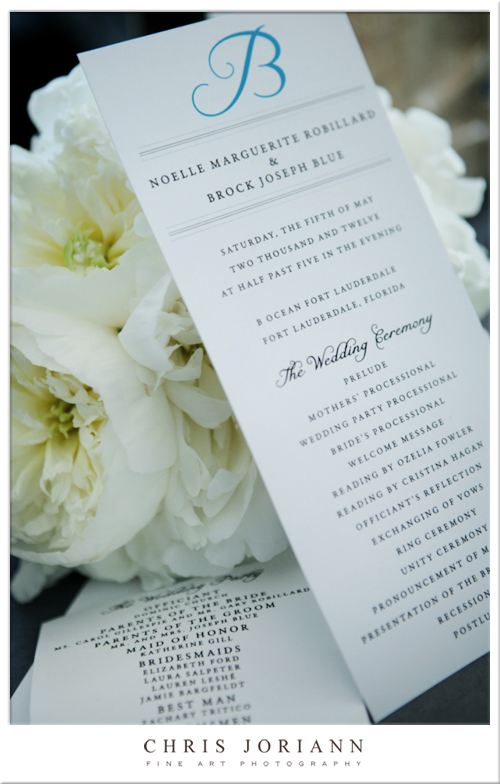 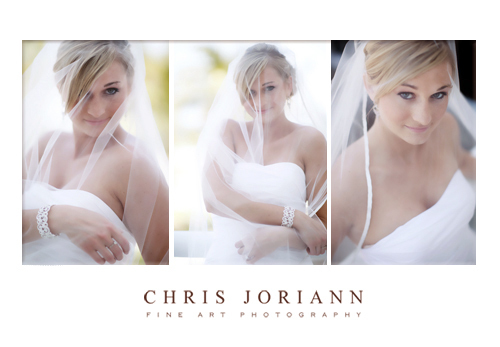 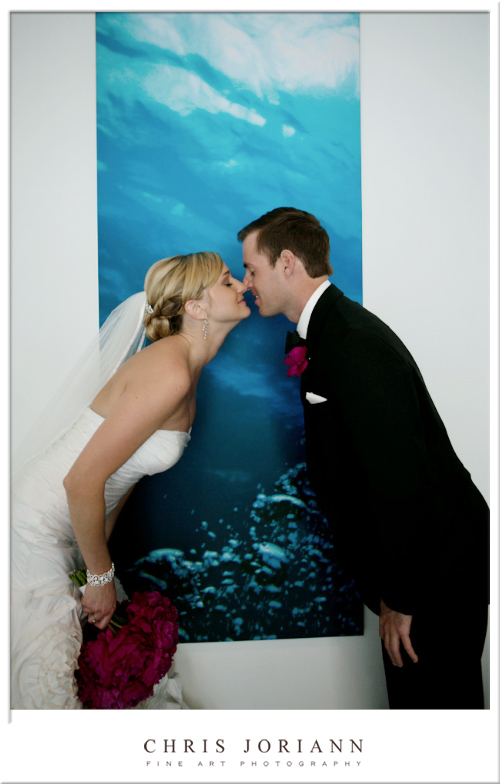 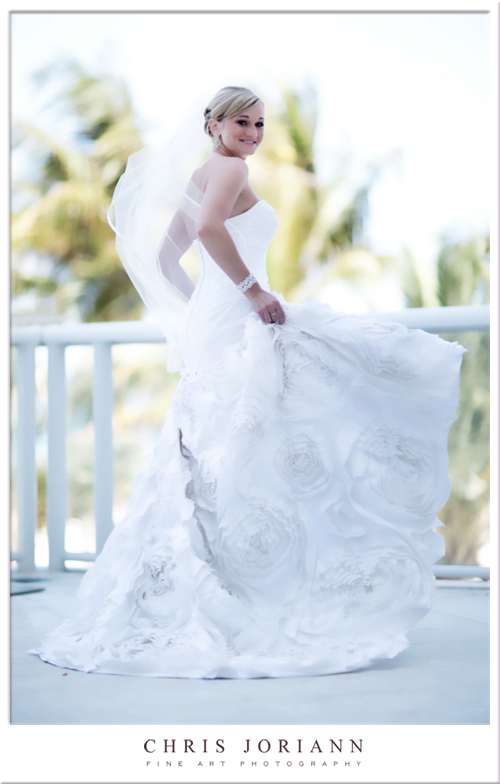 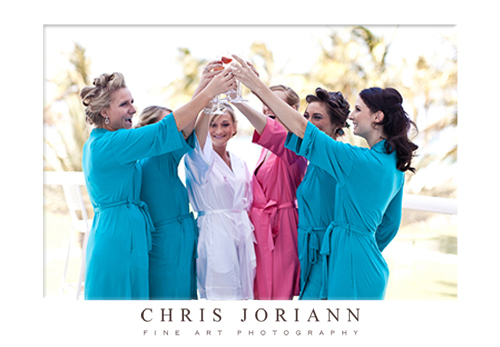 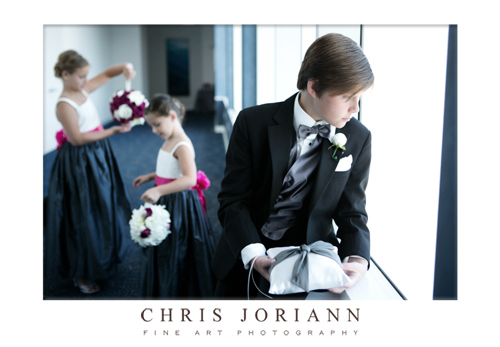 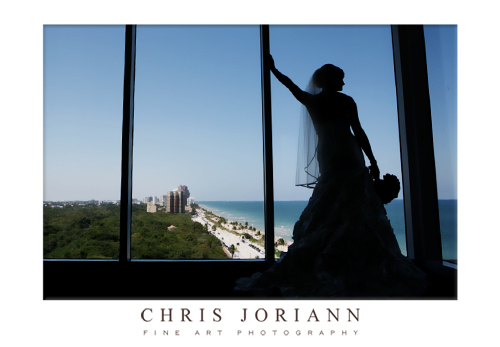 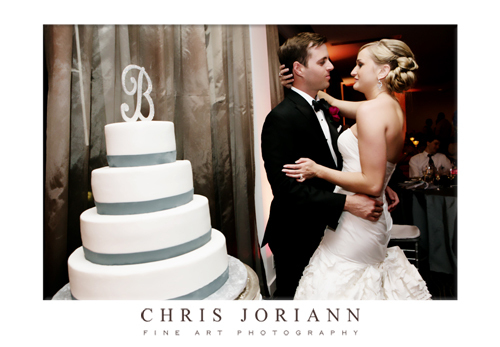 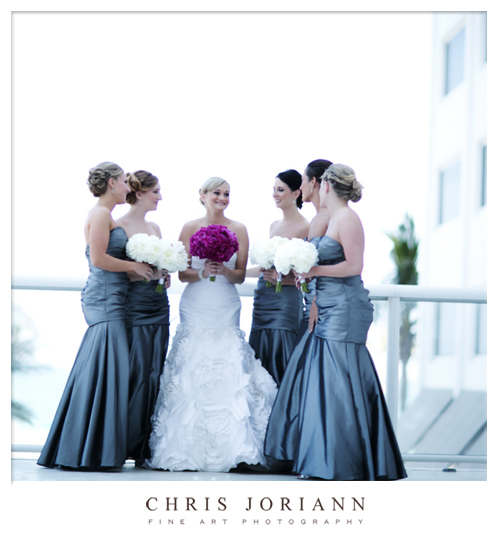 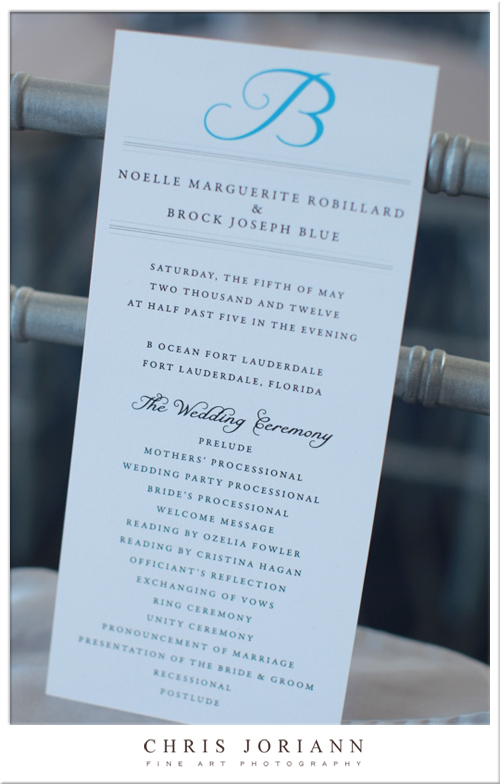 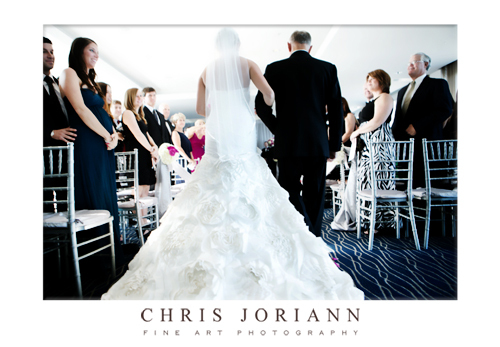 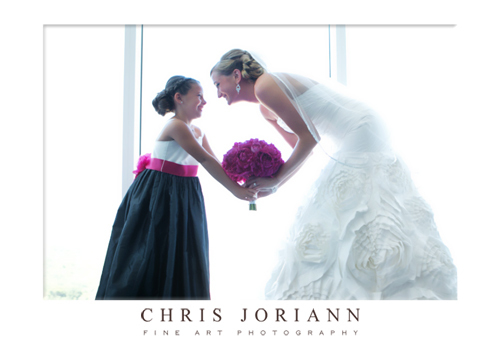 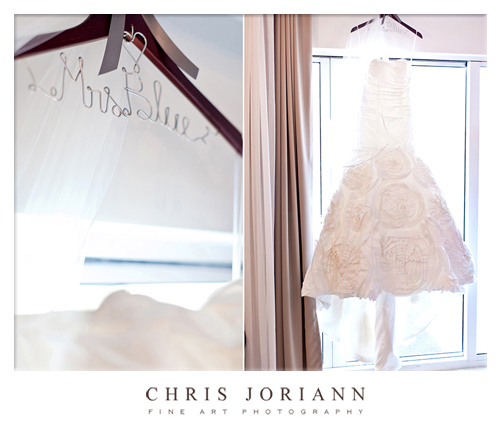 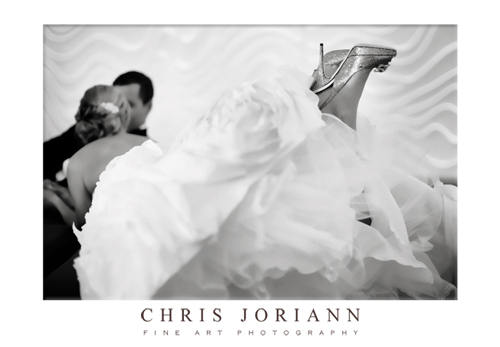 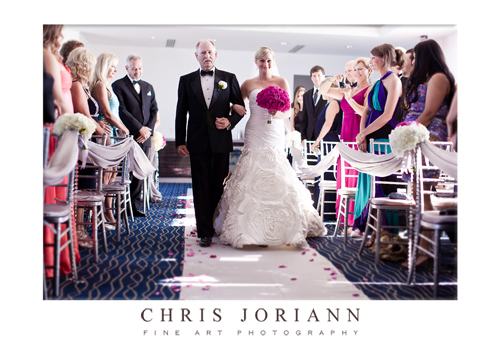 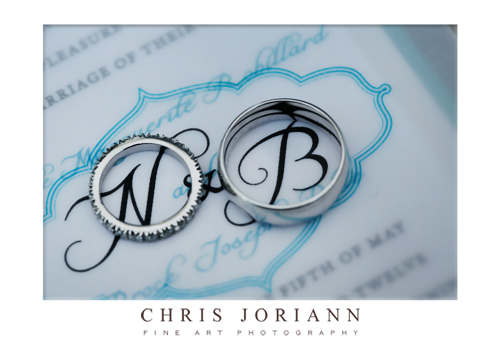 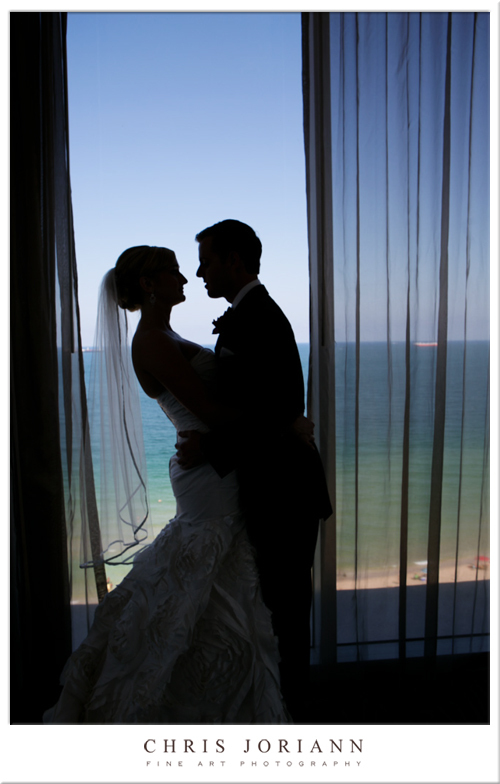 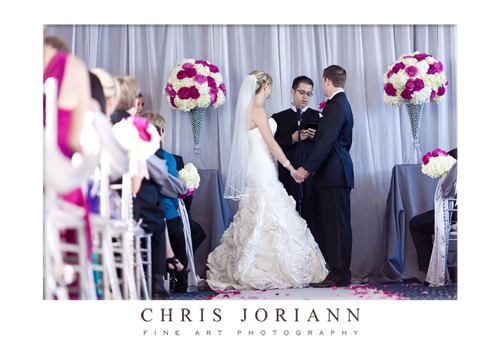 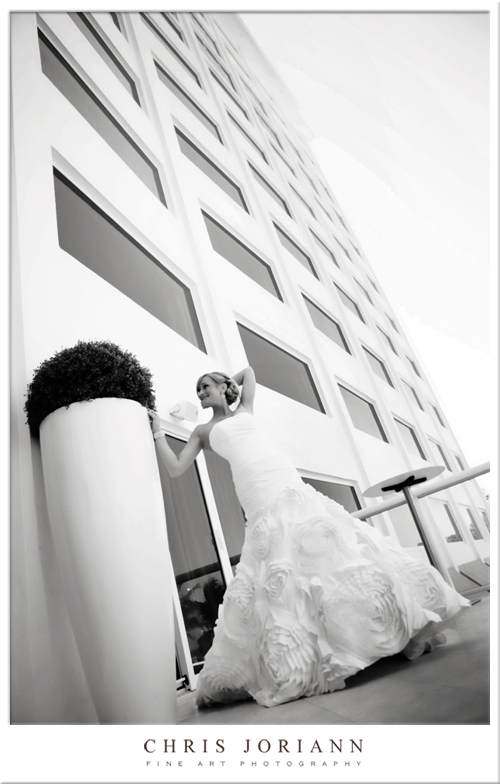 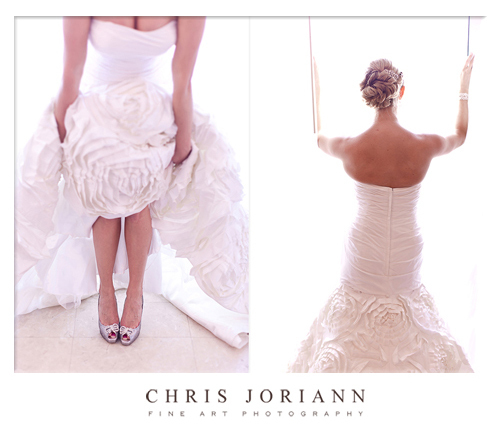 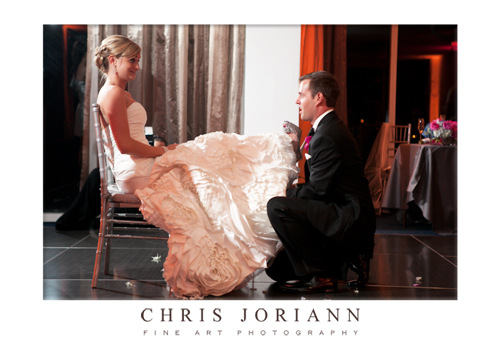 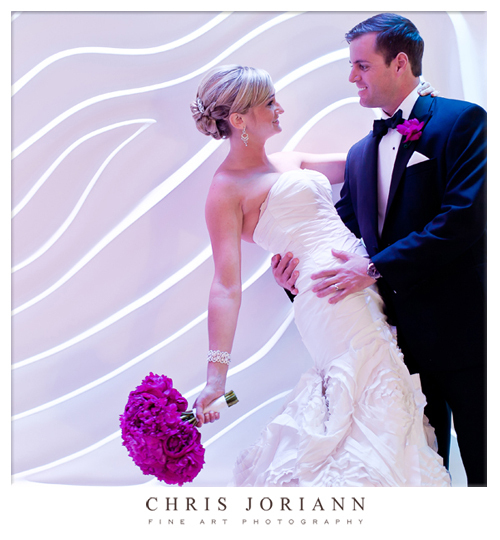 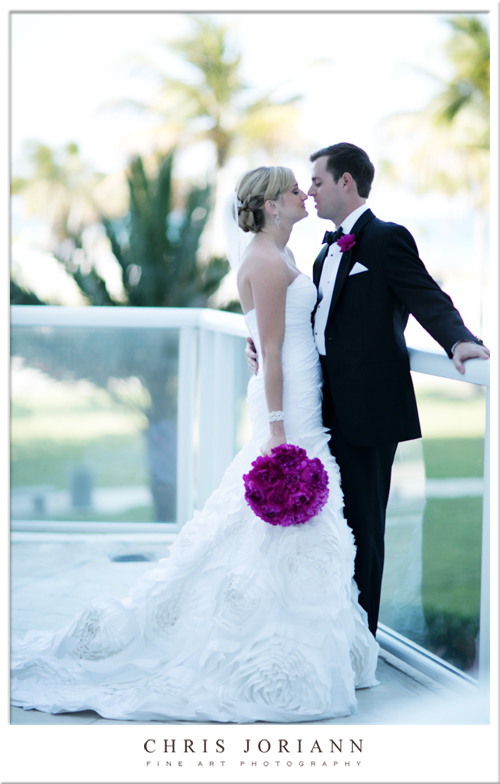 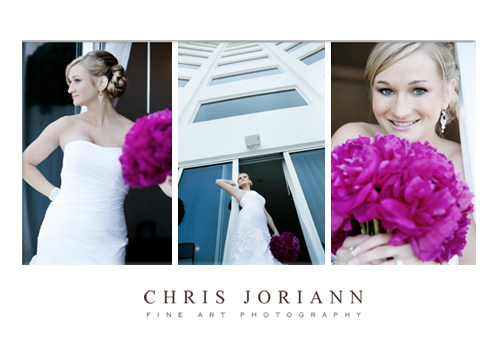 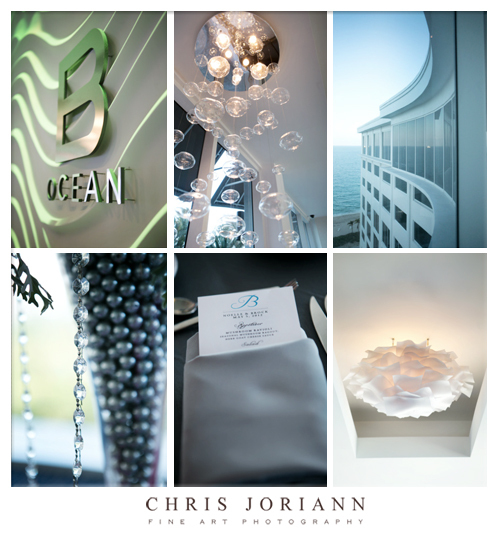 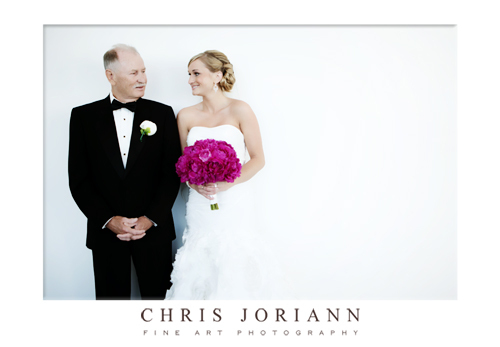 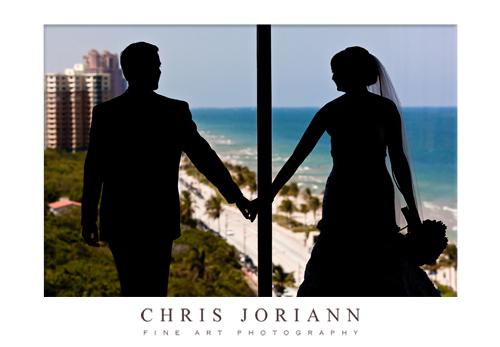 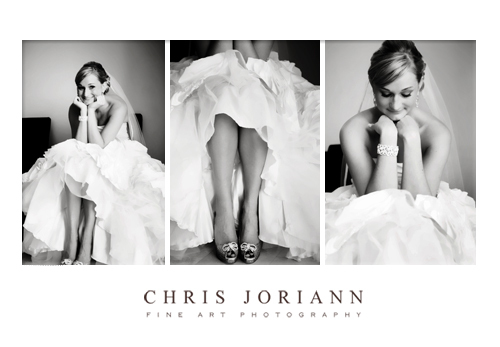 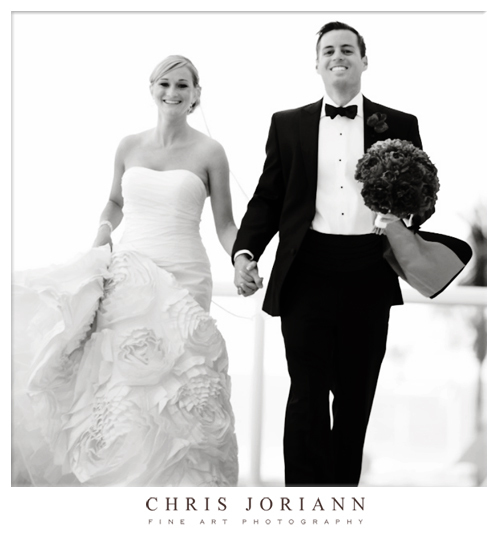 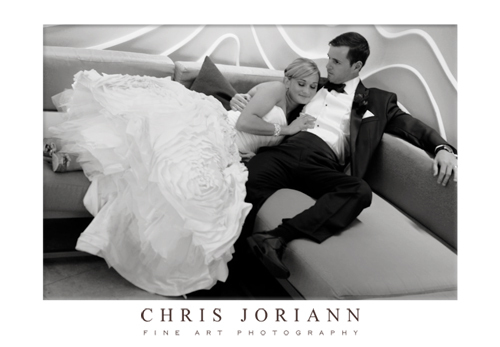 Noelle + Brock’s wedding took place at the new B Ocean in Ft. Lauderdale, overlooking the beach, beneath the super-moon! 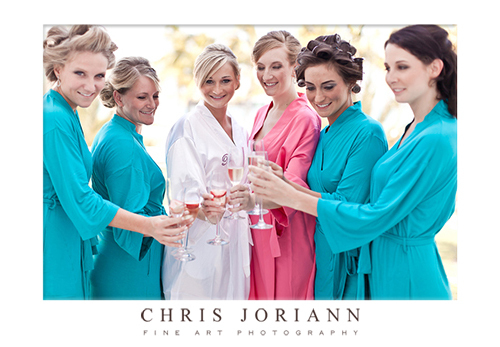 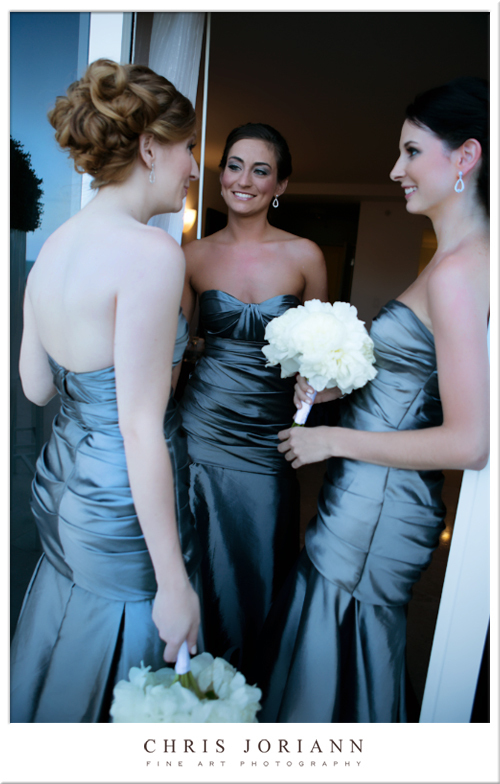 Earlier in the day, Noelle and her bridesmaids prepped in her suite. 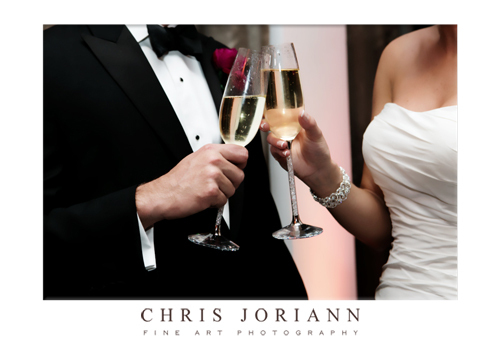 Here they share a pre-wedding toast. 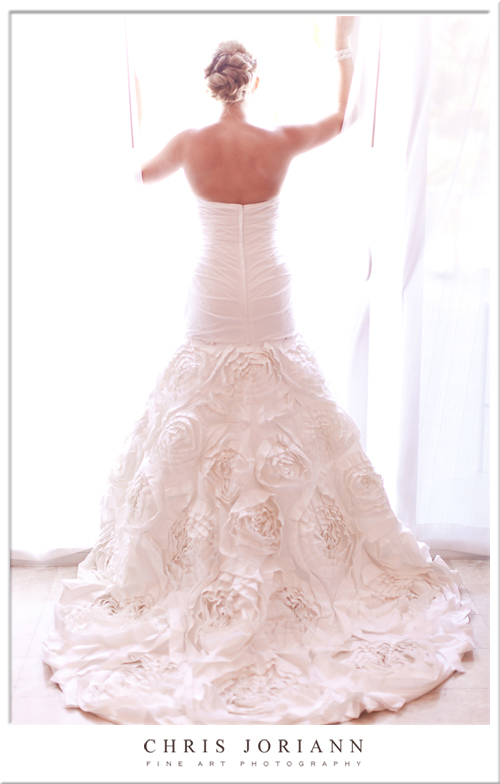 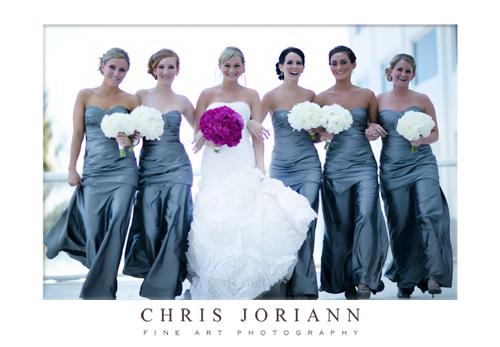 The bridesmaid’s helped her into her gorgeous gown, by Angelina Bridal Couture. 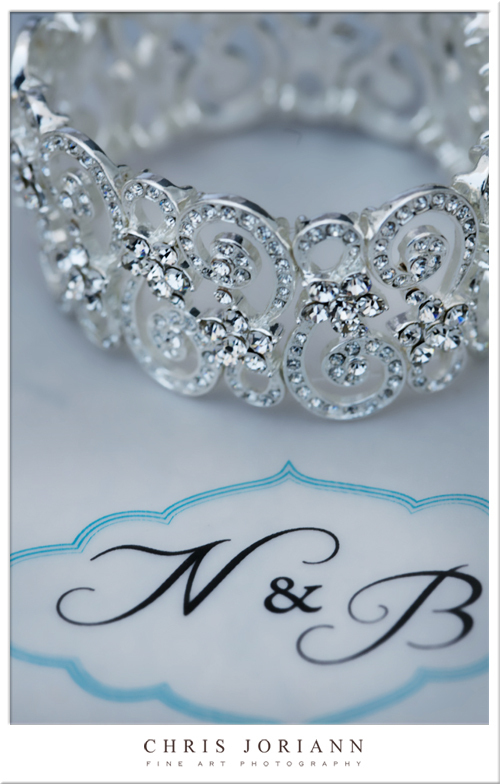 Love this great bracelet too… an etsy find. 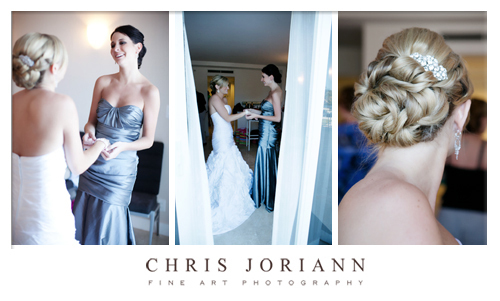 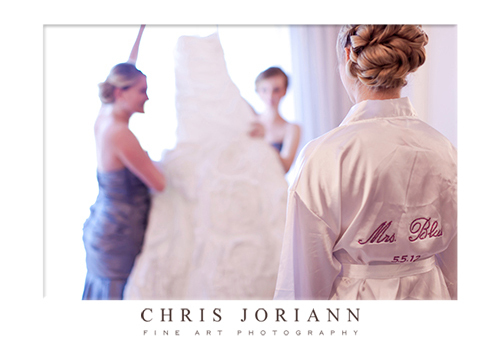 The bride’s elegant undo was perfectly coiffed by Summer Johnson of Catered Beauty. 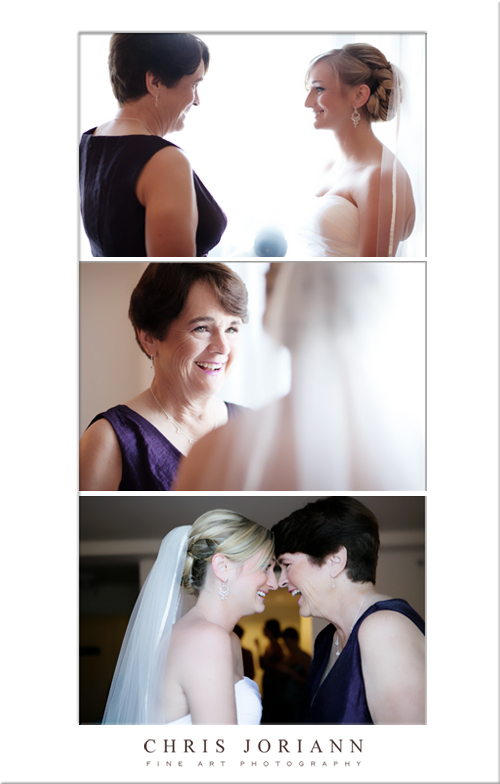 Once dressed Mom stopped by to assist with her daughter’s veil. 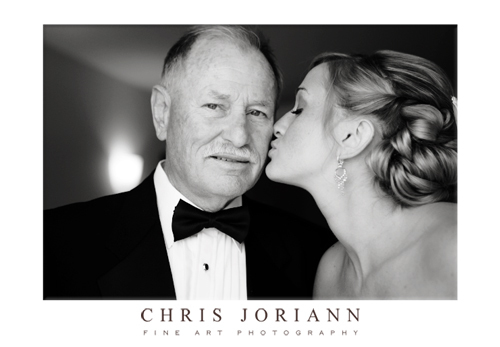 Dad popped in for a kiss, and got a surprise thank you gift as well. 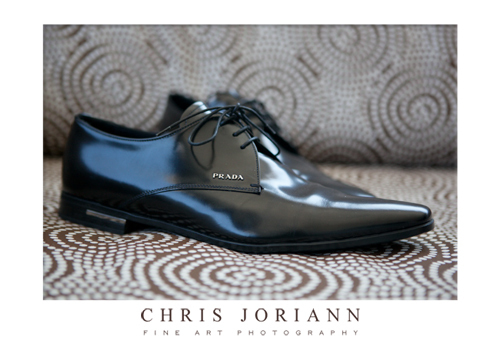 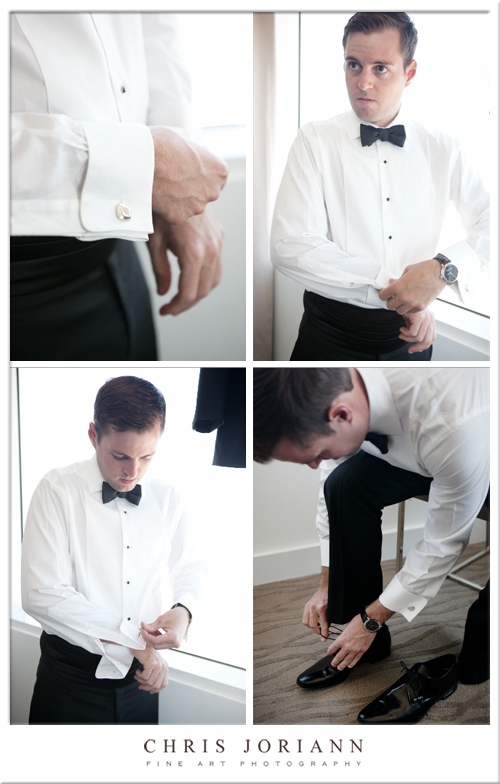 Meanwhile, over in Brock’s suite, the Groom wore PRADA! 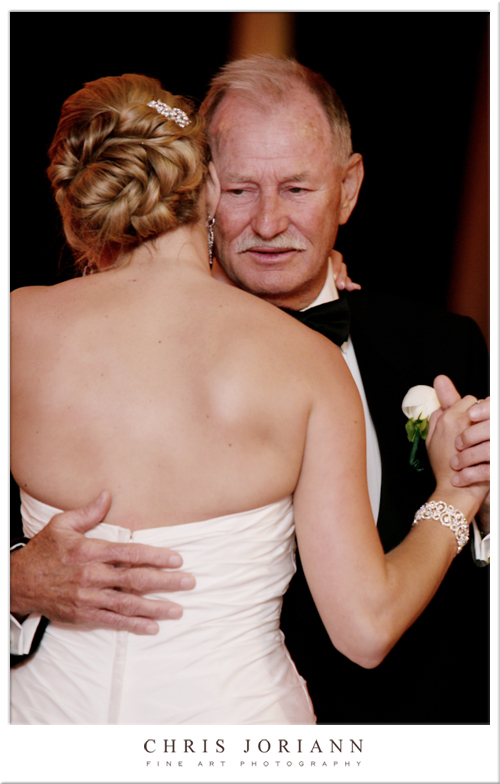 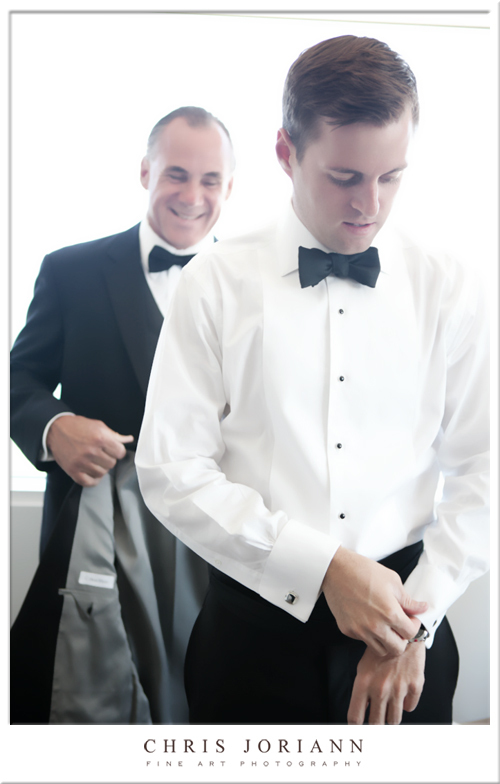 His handsome father helped him into his tux. 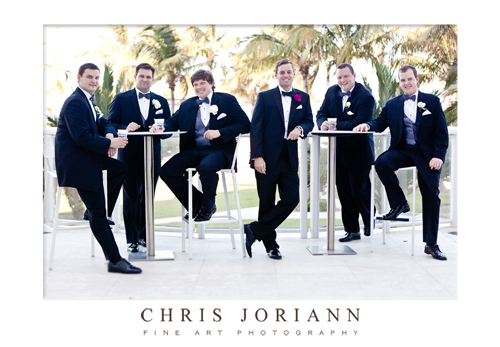 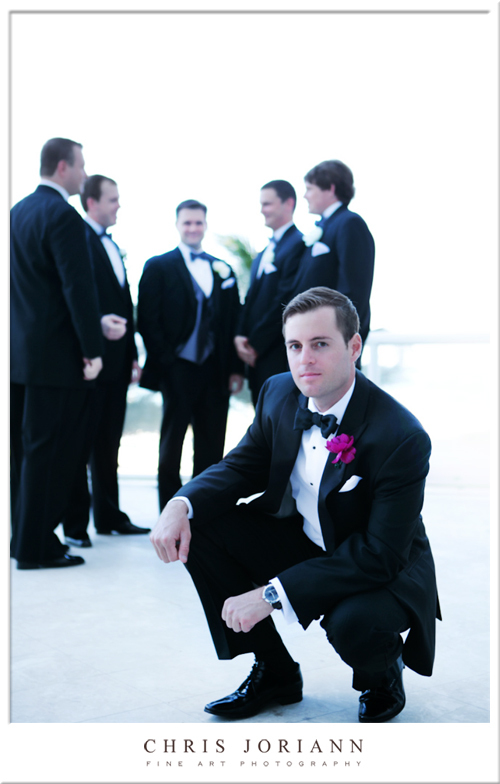 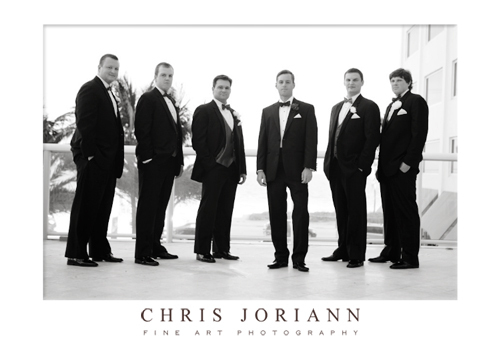 Then his groomsmen joined him for a quick photo session. 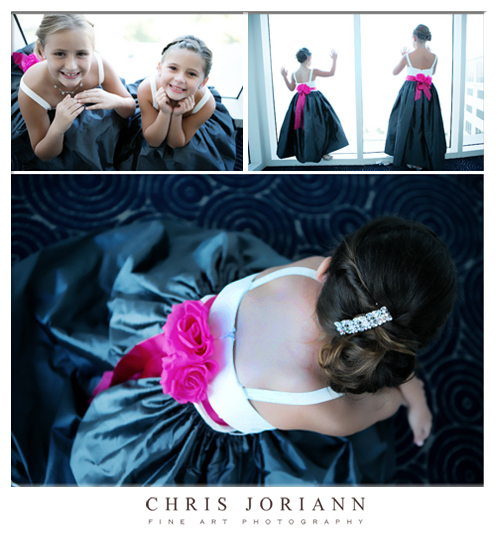 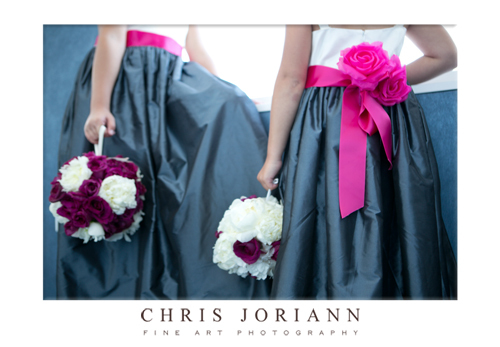 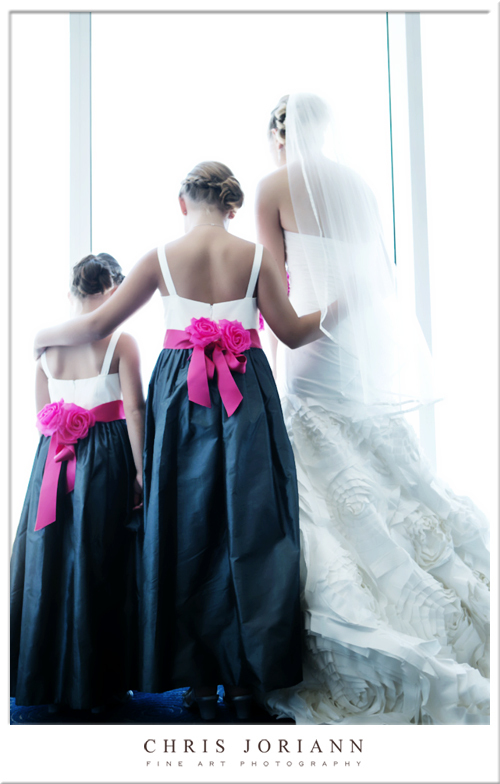 The flower girls, dressed in these adorable magenta bowed gowns, with grey taffeta skirts to match the bridesmaids. 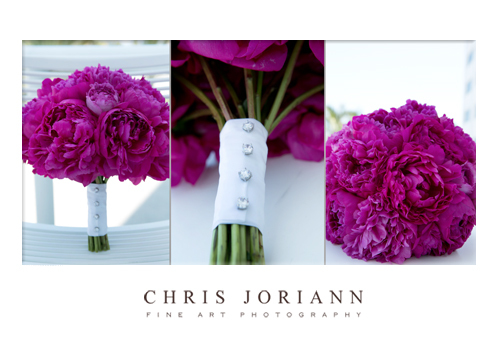 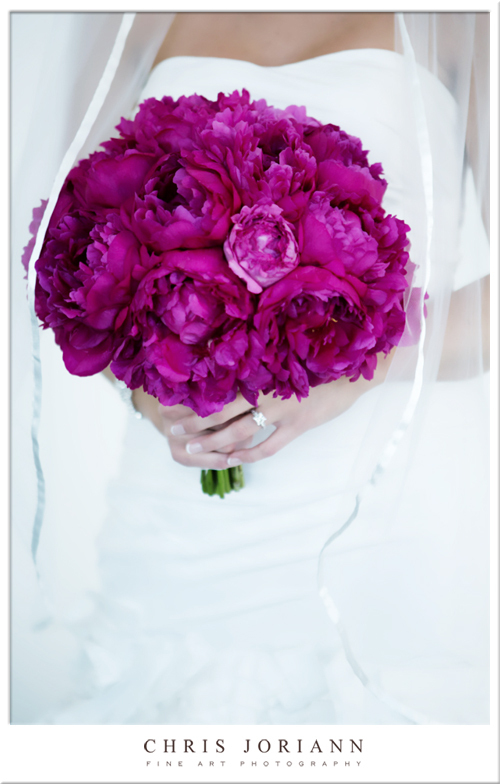 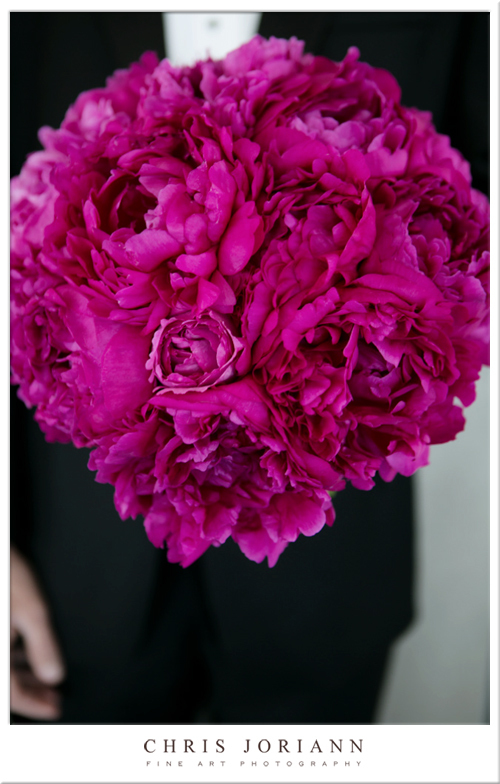 The littlest one presented the bride with her amazing bouquet of magenta peonies, created by Marcia of Beautiful Kreations. 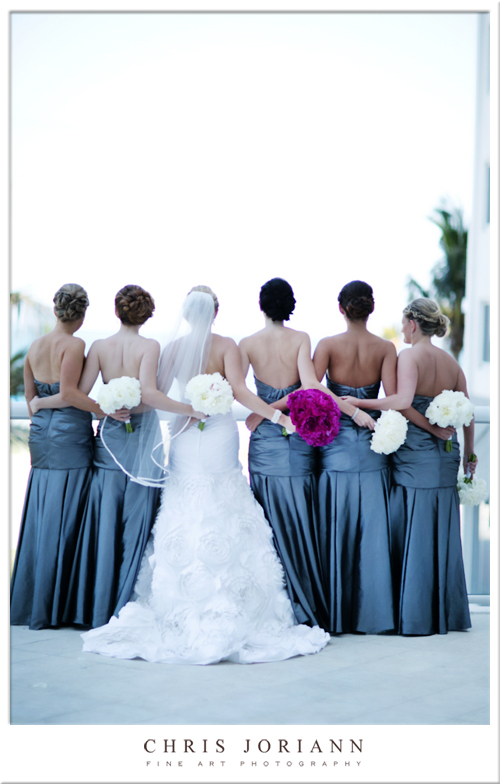 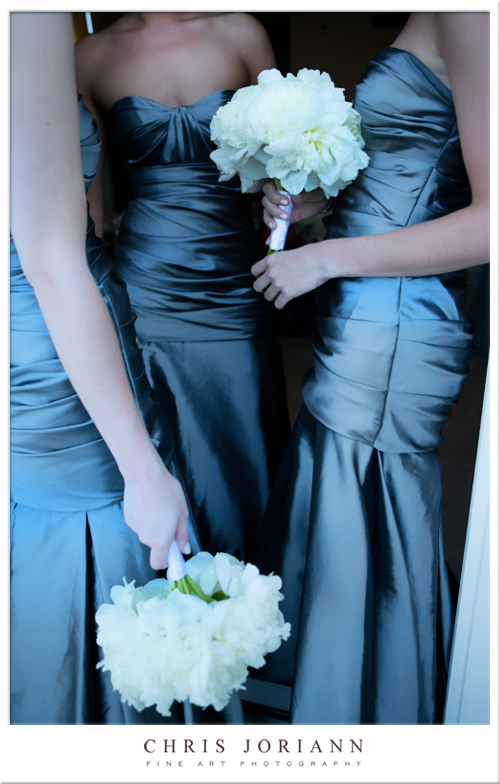 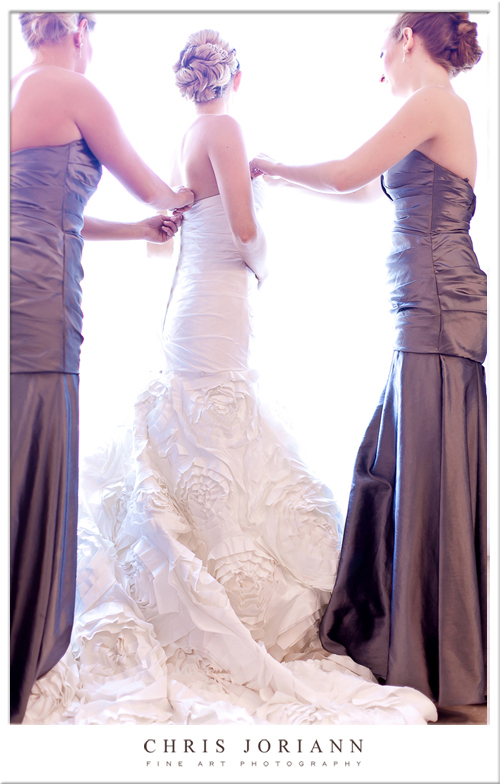 Noell’s bridesmaids, carried white peony bouquets, which looked great with their mermaid-style pewter gowns by Watters. 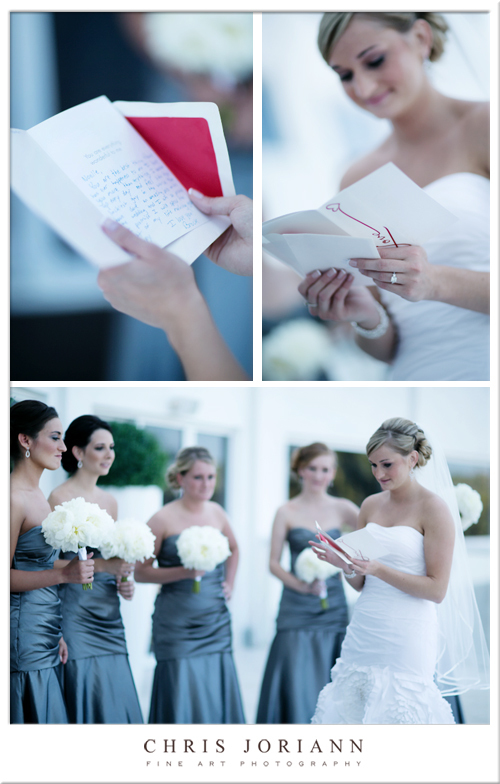 Here they looked on as Noelle tried her best not to tear up as she read the pre-wedding card they hand delivered to her from her soon-to-be husband. 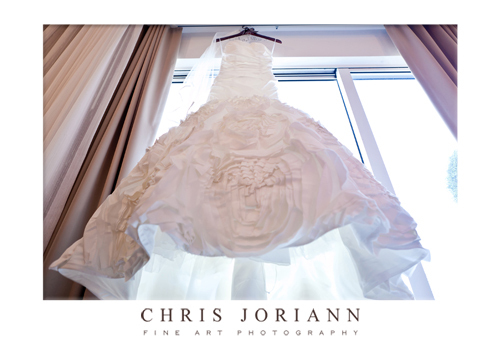 Soon it was time for the first look up in the penthouse. 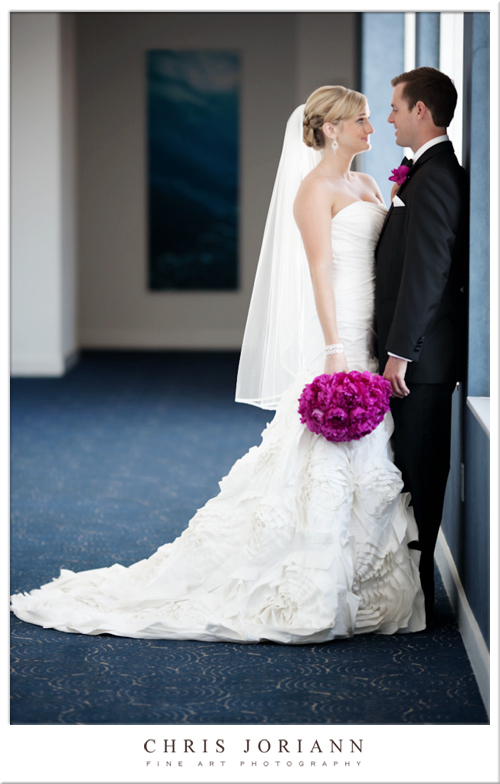 And took his place beside her!!! 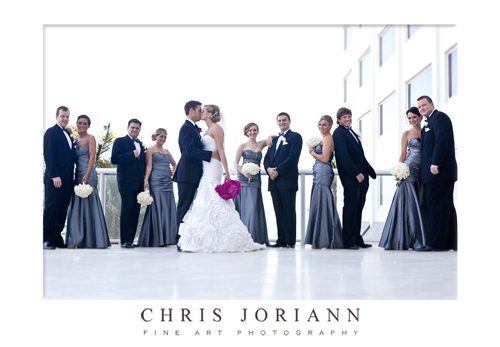 Then later, ventured out on the terrace with their beautiful wedding party. 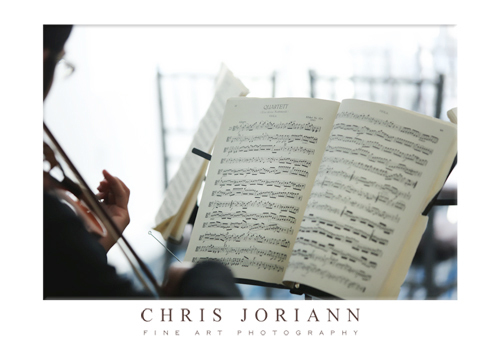 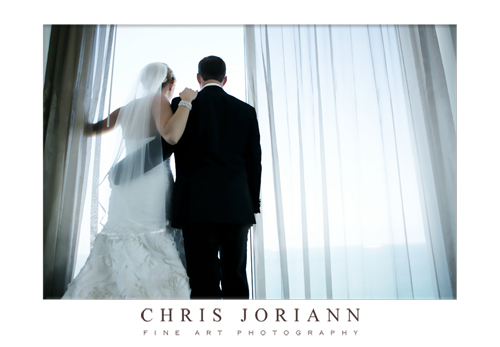 The couple enjoyed the view as guests arrived for the ceremony, held on the penthouse level. 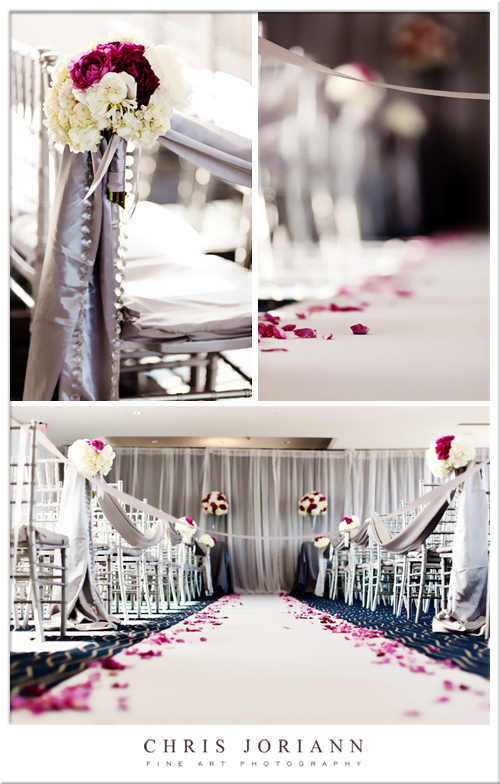 The aisle was lined with pink petals, surrounded by silver chiavari chairs draped in grey silk fabric, with hanging crystals and white hydrangeas on each aisle chair. 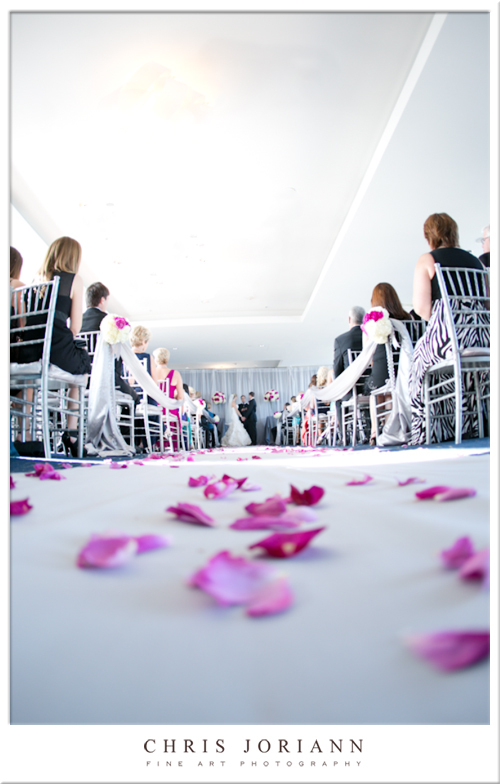 And down the aisle they went. 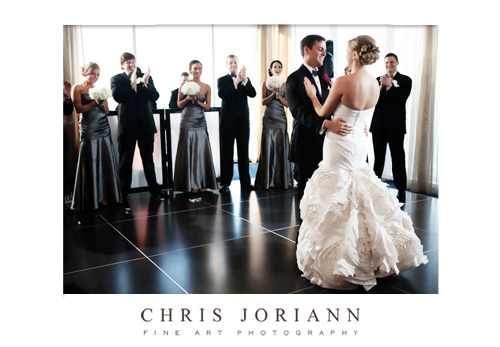 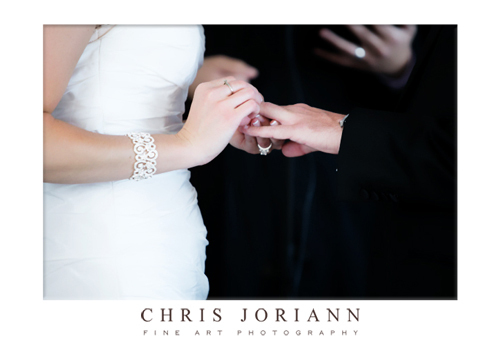 After a quick but poignant ceremony, the crowd applauded the new Mr. & Mrs. 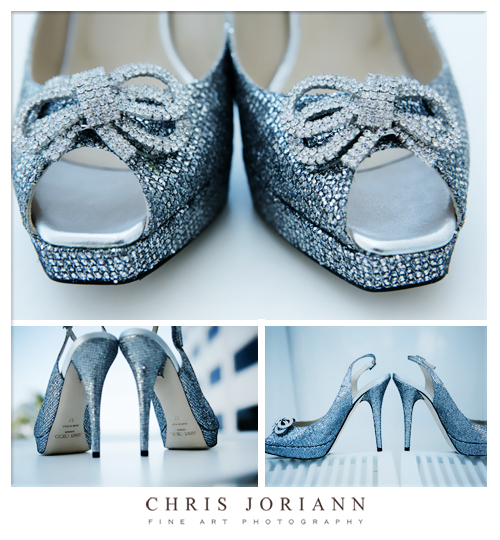 Blue!!! 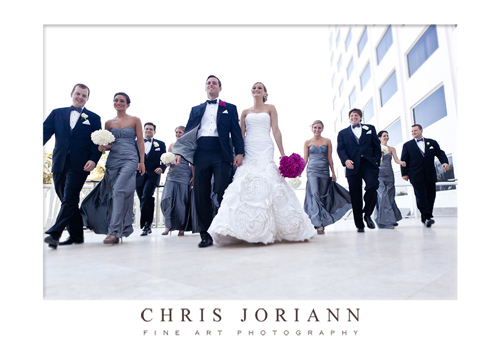 As guests adjourned to the cocktail hour, we stole the newlyweds away to join us in the ultra-contemporary lobby for some photo fun. 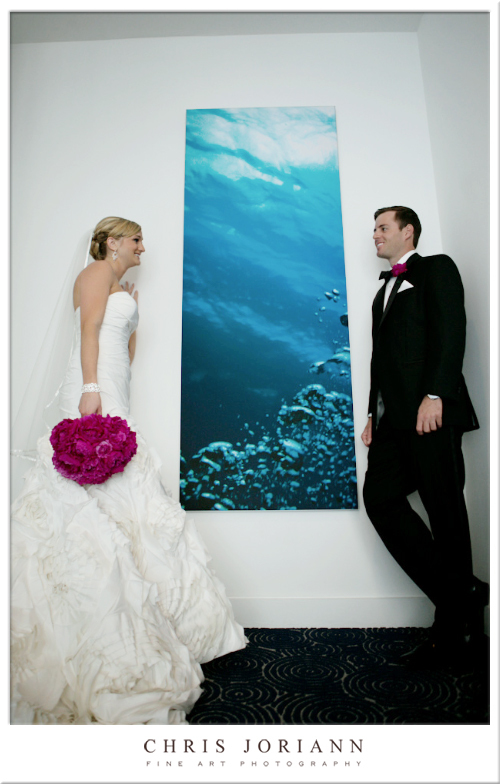 We just love the carved white wave walls. 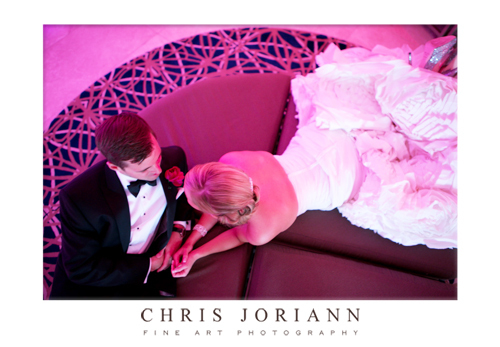 However, we soon found the lighting colors change completely every 30 seconds, purple, pink, orange, etc… making for quite the photographic challenge. 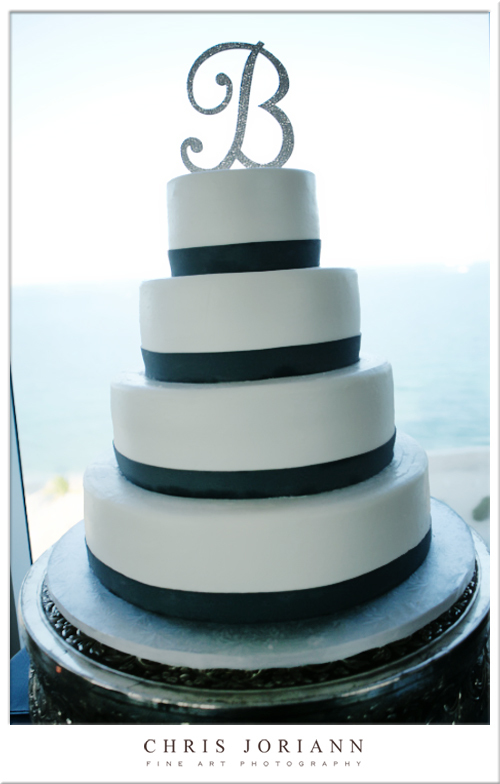 Okay… I give up… black and white it is!!! 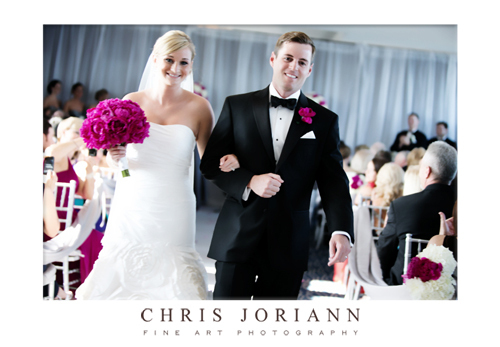 The couple soon headed back to join the party and greet their guests. 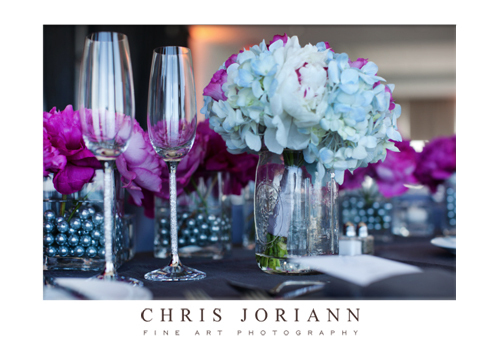 The reception space, orchestrated by Meaghan and Christi, the fabulous team at BlondeEvents, was chock full of eye-popping color and wonderful details. 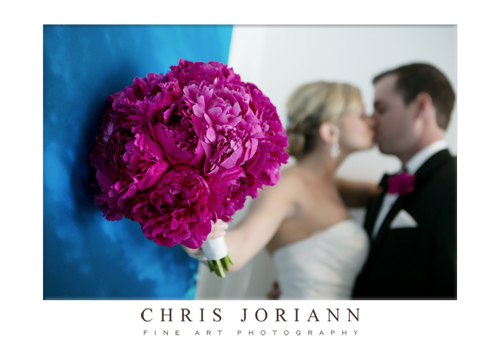 The blue carpeted all windowed-room, was the perfect match for the pink peony and blue hydrangea centerpieces, again, by Beautiful Kreations. 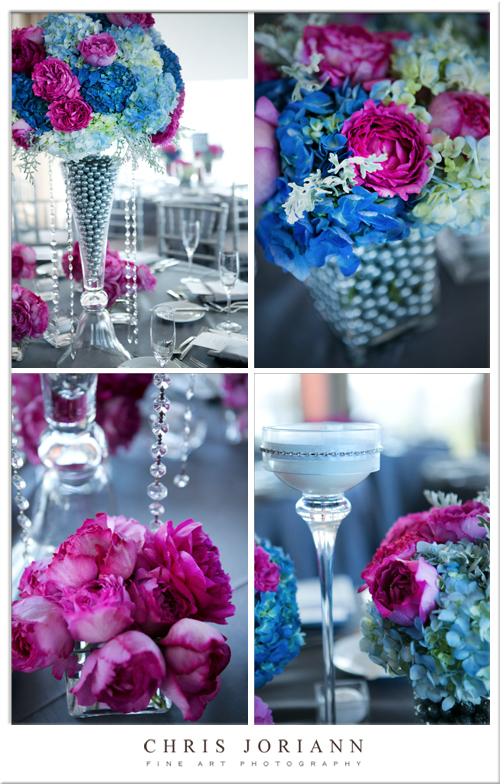 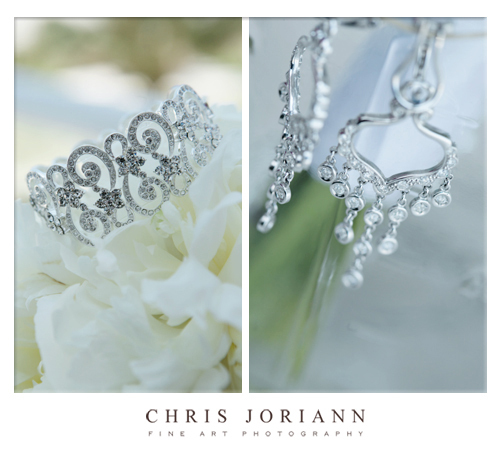 High and low vases were filled with silver beads, dripping in crystal, and tall glass rhinestone wrapped candle holders. 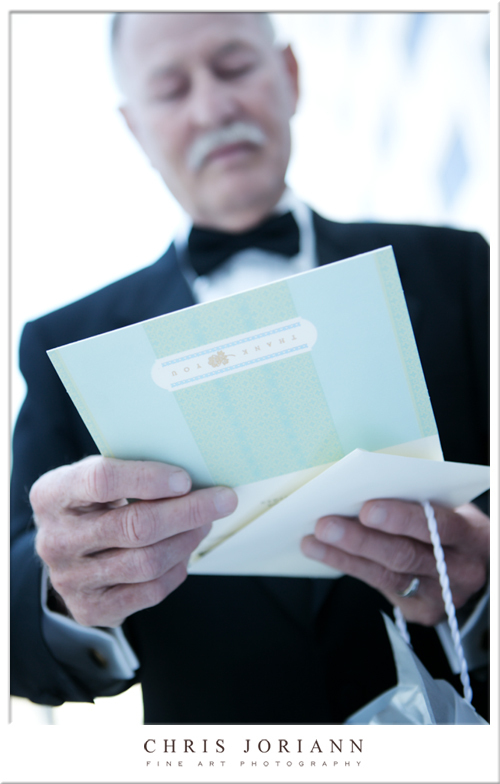 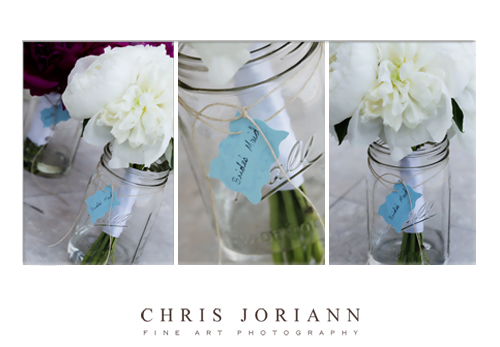 A table of “message in a bottle” inspired place cards greeted the invitees. 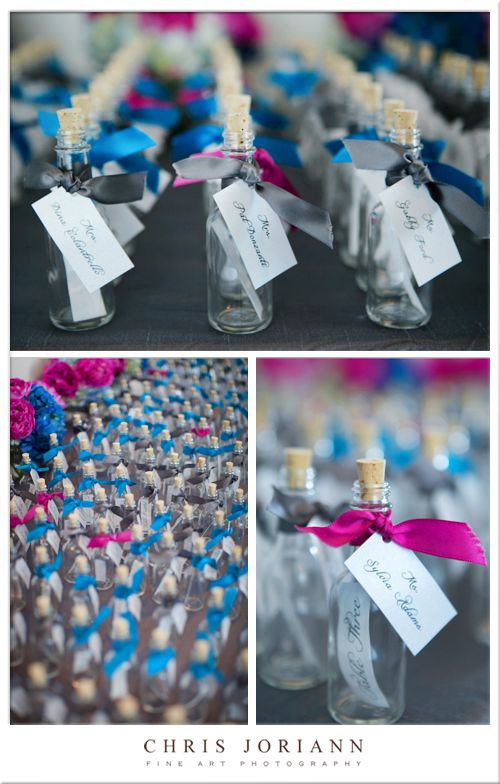 Their names were hand calligraphed, and tied with ribbon around the bottleneck, and the table number was inside the bottle. 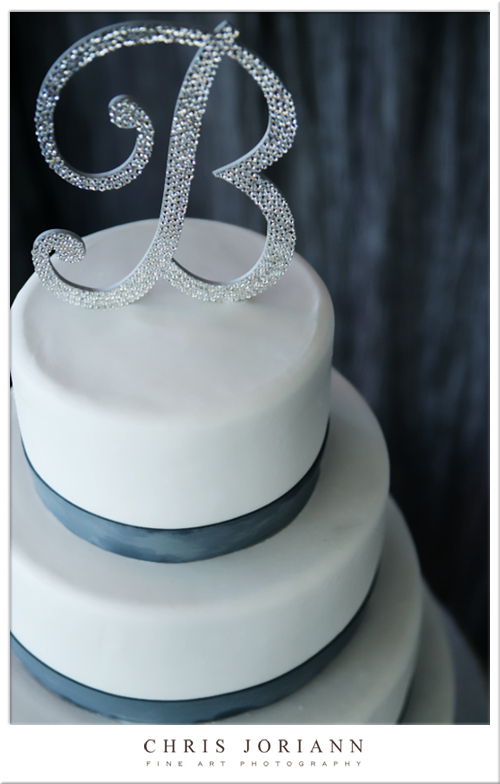 The four-tier fondant cake, by Edda’s Cake Designs, was wrapped in pewter blue ribbon, and topped with a Swarovski B. for Blue. 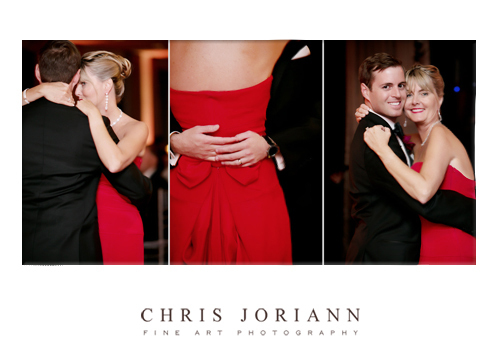 Noelle + Brock’s first dance got the night started. 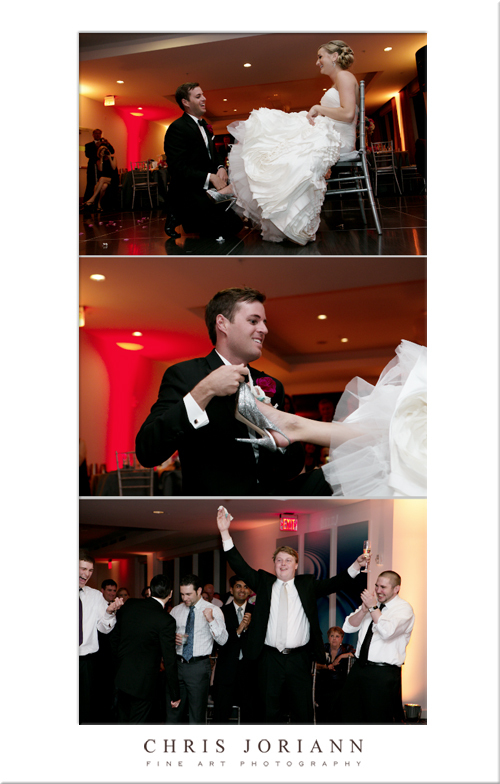 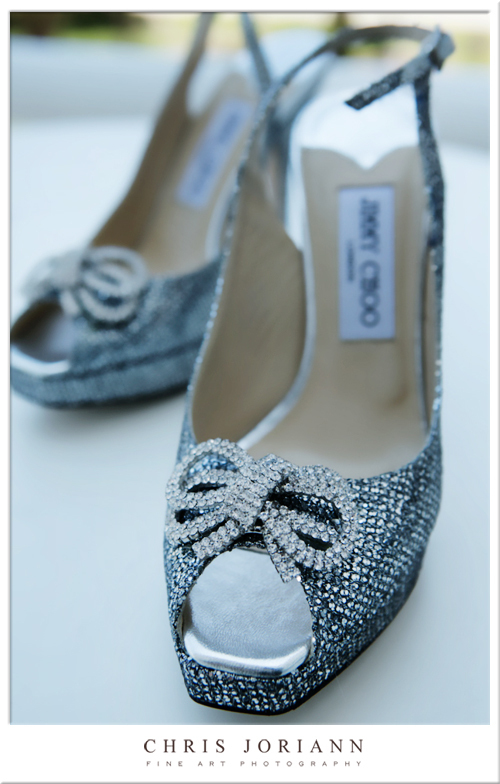 And the garter… don’t forget the garter!!! 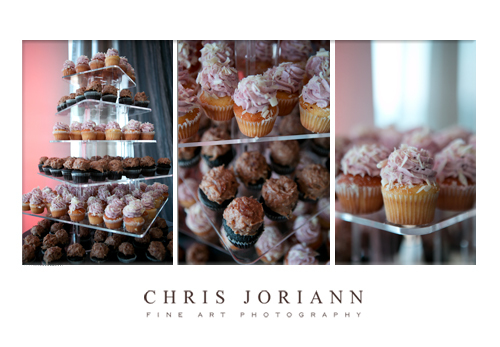 And the UH-MAZING cupcake tree, by Sweeter Days Bake Shoppe… yum! 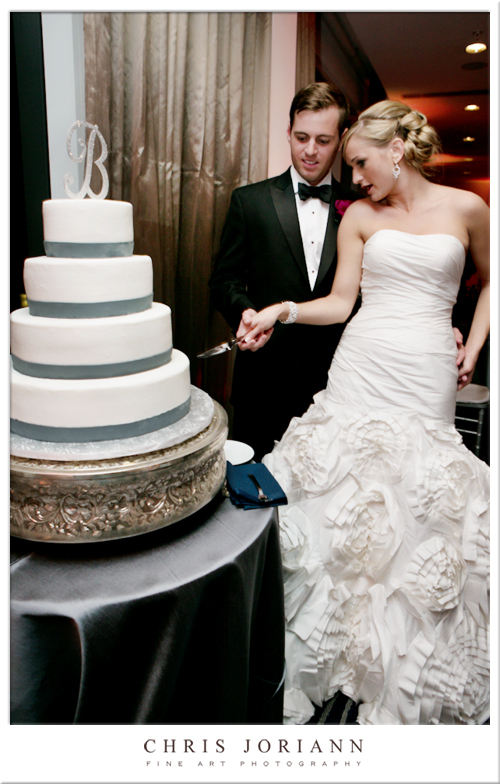 The night ended with the cutting of the cake. 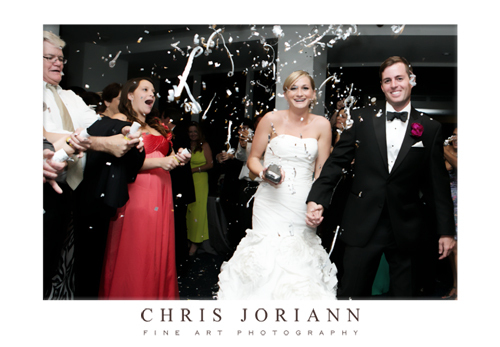 As the clock struck 12… the couple exited in fabulous fashion, as sparkling streamers sent them off to the elevators for their honeymoon to begin.